So, Porsche made this car called the Porsche 911 R, right. And it was basically a 911 GT3 RS with no big silly wing and a manual transmission. There were very few of them made, and because it’s the only Porsche that purists actually want, they sold for silly amounts of money. And that was the end of that... maybe? Only available in manual transmission form, it trades in the flash wingwork and the racy interior for the more subtle aero kit of the ﻿discontinued 911 R and a period leather-with-corduroy trim. And that sounds great. Really, it does. The Ideal Porsche. 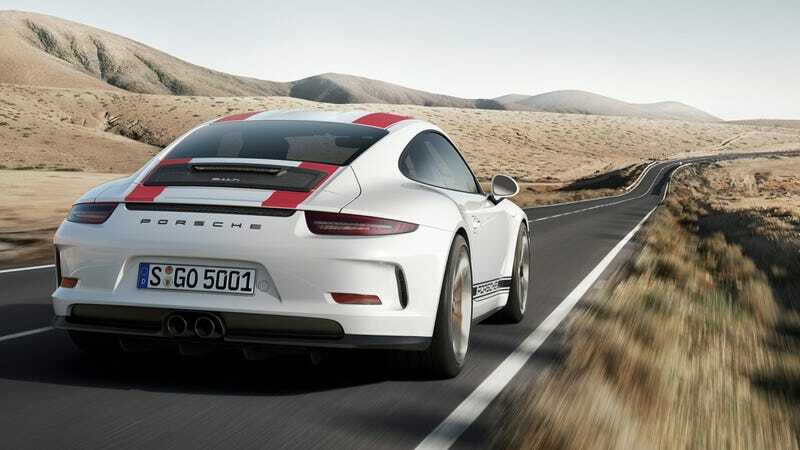 But it also sounds exactly like the 911 R. I mean, entirely like a Porsche 911 R. Except for the engine, which would be slightly different as it would have the one from the new 991.2-generation Porsche 911 GT3, and not the one out of the old 991.1-generation 911 GT3 RS. So maybe I’m missing something? Wouldn’t these be very much the same car? I know it’s a Friday and it’s unusually hot and that does things to the brain, but, uh, what? Usually I’d just chalk this up to a rumor from the silly Brits, who think that just walking absurdly counts as “humor,” so this is another one of their “jokes,” but Porsche 911 GT3 mules have been spotted here and there without wings. So it’s got just the slightest hint of plausibility. I imagine a Porsche 911 GT3 X90 would also cost a lot of money, too, similar to the Porsche 911 R’s original $185,000, but not people-selling-these-things-used-for-a-million-bucks chunks of change. And once everyone can get the car that you think is super rare, I imagine those prices will come way down. So I’m stumped, and although I asked Porsche what the deal was, they declined to comment. Everyone who overpaid for a 911 R must be really mad now.